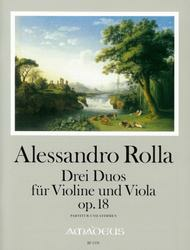 Composed by Alessandro Rolla (1757-1841). Edited by Bernhard Paeuler. Sheet music. Score and parts. Op. 18. Amadeus Verlag #BP 1370. Published by Amadeus Verlag (M7.BP-1370).